I took so many great pictures during our visit to the Sertoli Salis winery in Tirano (Valtellina) that I couldn’t use them all even in three pages, so here they are. Some are fuzzygraphs because I did not want to use flash on the interior frescoes, but I’ve included them anyway to give you at least a fuzzy idea what they look like. This entry was posted in Italian food, Italy travel and tagged Italian food, Italy, Italy travel, Valtellina, wine on May 10, 2009 by Deirdre Straughan. 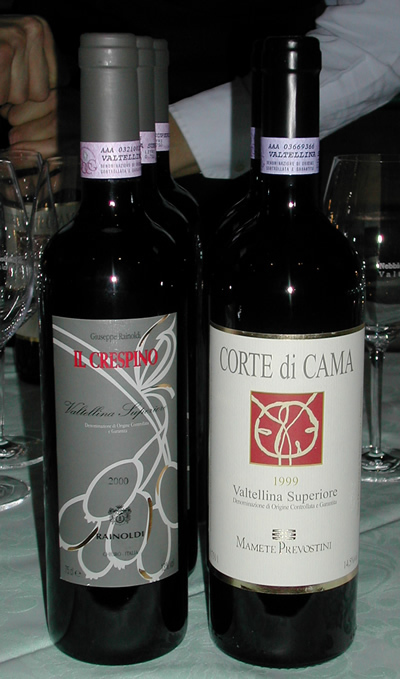 Back in February, we were invited (as Slow Food members) to attend a presentation of Valtellina wines in nearby Erba. Since we moved to Lecco, we’ve missed out on all the Milan Slow Food events, and there haven’t been many here in our area, so we were happy to go to this one even though we already know quite a few Valtellina wines – they have been our favorites for some years. This event was a wine tasting plus dinner, at a cost of around 45 euros each if I recall correctly. Which turned out to be cheap, considering that we got a six-course meal and all the wine we could drink. We came in towards the end of the press conference/discussion, which had about 50 attendees, most of whom seemed to be the wine producers themselves, plus a few journalists and critics who already knew Valtellina and its wines very well – very much preaching to the choir. If they really want to get these wines noticed and appreciated elsewhere, they are going to have to work harder to get the non-believers to attend their events. Amusingly, just because we were there, people seemed to assume that we were somehow involved in the industry. Enrico tried to use this to scam some free wine glasses from the head of the Triacca winery, but we never received them. When the conference ended, we went to the reception area, where a long table was set out with about 30 different Valtellina wines, and very attentive young waiters pouring them. We could taste any or all, and between the two of us managed to get through most of them – on empty stomachs. So you’ll forgive me if I don’t remember much about the dinner! This event happened to be the last of RistorExpo, which we had not attended – from what we saw as we passed through the expo area, next year we will definitely have to go. There had been other dinners and tastings in connection with the expo that I’m now sorry we missed. Chefs had come from other parts of Italy for some of these, so I got to chatting with a guy from New York, working at one of the famous restaurants in Tuscany, along with his delightfully extroverted Tuscan boss. We’ll have to check out that restaurant sometime. 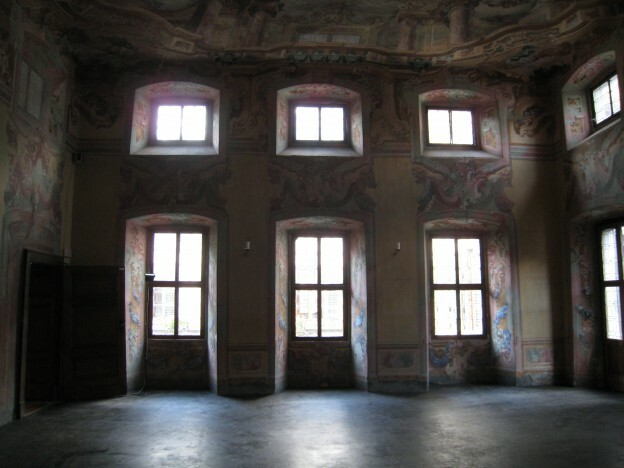 At the dining tables, when we eventually reached them, each place was set with six wine glasses. We were twelve to a table, with one wine producer at each. Ours was Elena Fay, who unfortunately was sitting across the very broad round table from me, so I didn’t get to hear much of what she said. Another person at our table was a wineseller in a small town further up the lake. 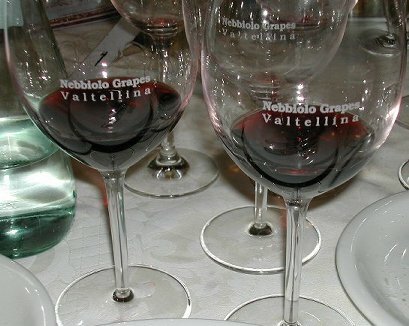 As the glasses imply, Valtellina wines are made from the Nebbiolo grape, which is also the basis of many Piemontese wines. I’m not a wine expert, but I do love these rich reds, especially the Sfursat that I have written of before. Our favorite, the Cinque Stelle from Negri, has become better-known in recent years, and is now priced out of our range except for very special occasions. Dinner was the joint effort of chefs from two different Valtellina restaurants, one of which was Il Cantinone. The dinner was so good that we went to the restaurant on another occasion, when we happened to be in Madesimo, and ate extremely well. It’s a member of the Ristoranti del Buon Ricordo group. As I said, I don’t remember much about the dinner, except that it was delicious – part of the reason I’m not very good at writing descriptions of the food is that I frequently don’t remember it very well the next day! 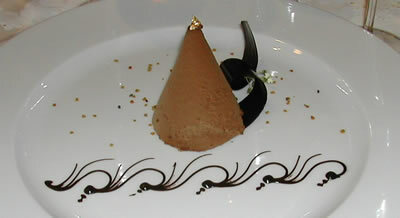 I did have the presence of mind to take a picture of the lovely dessert. This entry was posted in Italian food and tagged Italian food, wine on August 24, 2004 by Deirdre Straughan.